Is the pain of climbing stairs getting to be a challenge due to physical handicaps such as knee replacements and arthritis, bad health, or just old age? The solution may be an in-house elevator. There once was a day where installing an elevator in a home was only an option for the wealthy, however they are becoming much more popular than most people realize. An investment of $10,000 - $25,000 depending on the degree of remodeling can give you your very own elevator!�There are a number of loan products (an FHA 203k comes to mind) that can make this sort of home improvement affordable, and roll the cost right into your mortgage. The biggest obstacle to installing an in-house elevator is figuring out a place in your home to install it. The ideal situation is two stacked 8x8 closets. If your home doesn�t have the ideal situation, though, don�t worry. There are numerous other ways the companies can make it fit in your home. Every home and every situation is different and they will work with you to configure a custom solution.�The elevator itself can run on average $15,000 - $30,000, depending on the bells and whistles you add.�Other costs include an architect and builder, which will vary depending on the situation. The best place to start is to call a mobility company and have an in-home assessment. 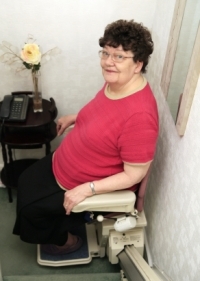 They will visit your home and make recommendations on if and where either an elevator or stair lift will work. Depending on what modifications need to be made, they may put you in contact with an architect and builder. Industry experts claim that you can see as much as a 10% premium added to the value of your home, but that, too, is going to depend on the situation.